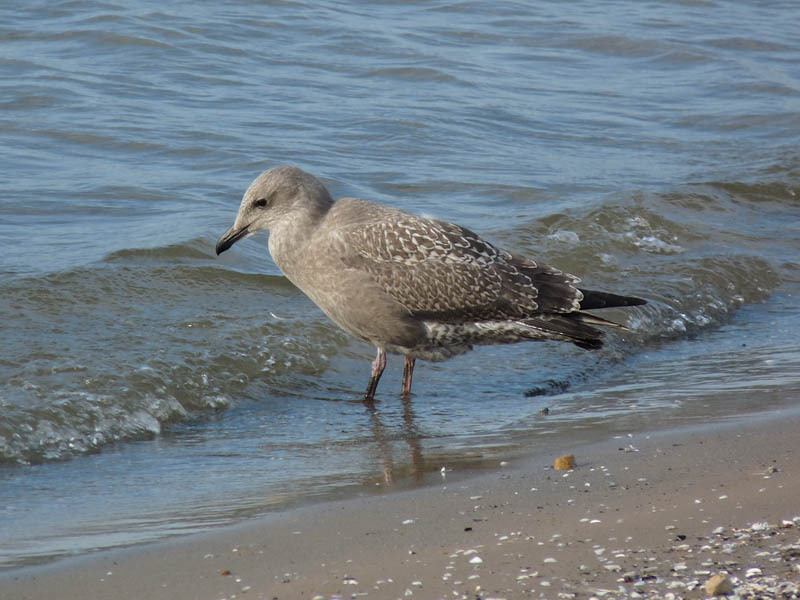 Juvenile Herring Gull at Montrose Beach, one of three (click to see the larger version). I had my first juvenile Herring Gulls (3) of the year on July 18. I usually start to see juvenile Herring Gulls about one month after the first juvenile Ring-billed Gulls show up, which is around the third week of June. There were also a couple of Semipalmated Sandpipers on the beach, a few Caspian Terns, including a whistling juvenile, and hundreds of dragonflies over the beach, dunes, and meadow. This entry was posted in Summer Bird Reports and tagged Caspian Tern, Gulls, Semipalmated Sandpiper, Shorebirds, Terns on July 19, 2013 by rhughes. Cliff Swallow (click to see the larger version). Several Cliff Swallows have been hanging around the dunes at Montrose with the scads of other swallows. I photographed this juvenile on July 16. Young Cliff Swallows are highly variable in terms of head pattern, much more so than our other regularly occurring swallows. Some can be dark headed like this individual while others can have white spotting on the forehead and throat. The dark head and dark centers to the undertail coverts identify this Cliff Swallow, vis a vis Northern Rough-winged and Barn Swallows. This entry was posted in Bird Identification, Summer Bird Reports and tagged Cliff Swallow, Swallows on July 18, 2013 by rhughes. Bank and Northern Rough-winged Swallows (click to see the larger version). Montrose Dunes has been excellent for swallows lately. 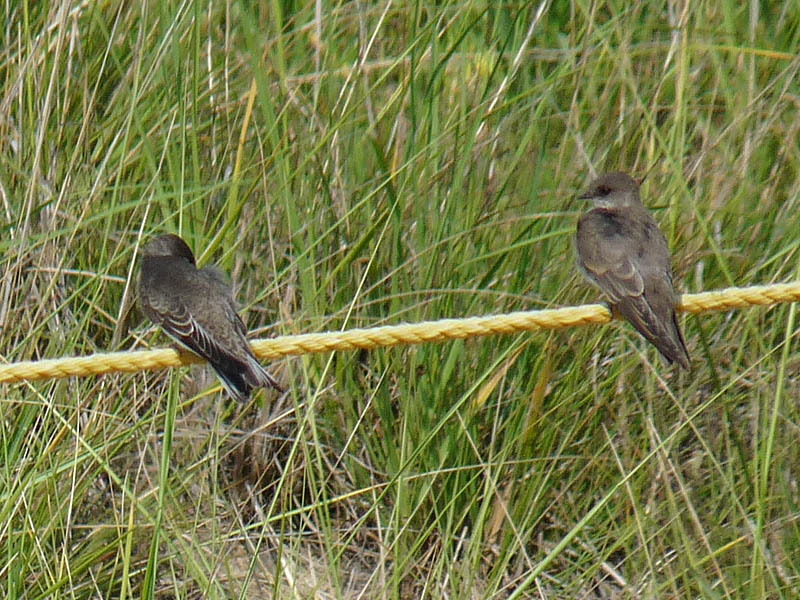 On July 15 I photographed a juvenile Northern Rough-winged Swallow next to a juvenile Bank Swallow on the yellow rope that cordons off part of the south end of the Dunes. These 2 “brown” swallows can look alike from behind. 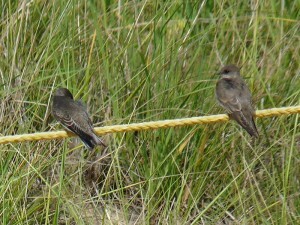 In the photo to the right, note the narrow whitish edges to the tertials and primaries and the lack of rufous in the wing coverts of the Bank Swallow (left bird). The juvenile Rough-winged has duller edges to the tertials, and rufous edges to the primaries and wing coverts. The Bank Swallow also has a paler rump than the Roughie and pale edges to the tail feathers. I wasn’t aware of this later feature until I noticed it yesterday, and I’m not sure it’s a completely solid field mark but I didn’t notice it on any of the Rough-winged Swallows I looked at. 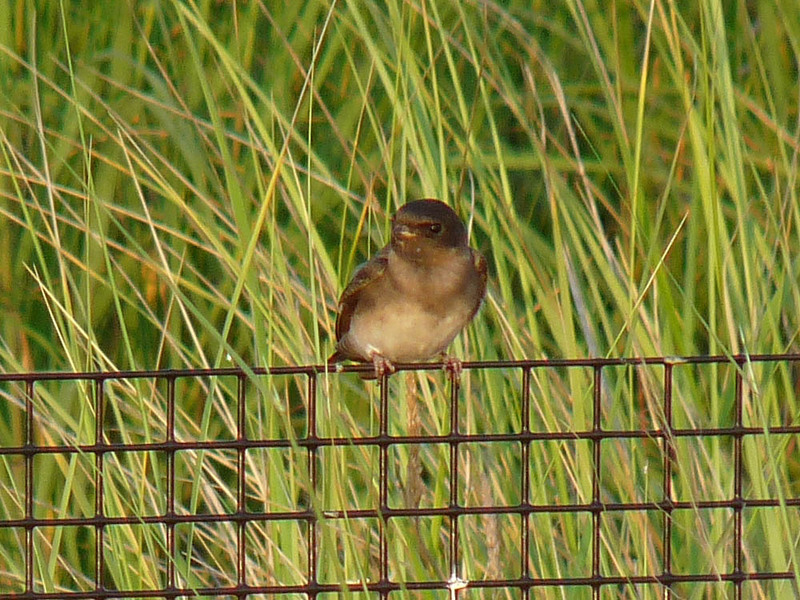 This entry was posted in Bird Identification, Summer Bird Reports and tagged Summer Swallows, Swallows on July 16, 2013 by rhughes. 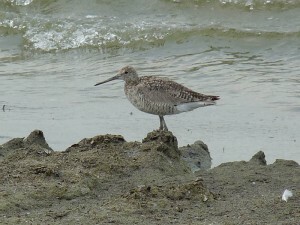 Three Short-billed Dowitchers were at the beach this morning, July 16. Two birds were on the beach inside the protected area and another was feeding in the fluddle next to the Fishhook Pier. The 2 on the beach flew off shortly after I identified them but the bird in the fluddle remained. 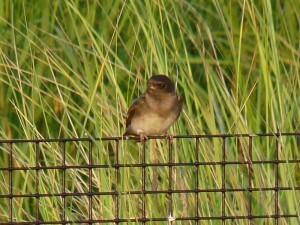 This bird was present yesterday evening as well. I also had 2 Least and 2 Semipalmated Sandpipers on the beach. Montrose Dunes has been excellent for swallows lately. This morning I had all 6 of our regularly occurring species either flying around or perched on the yellow rope at the south end of the Dunes. This is a great opportunity to see, study, and photograph these birds, especially when they’re perching on the rope. This entry was posted in Summer Bird Reports and tagged Shorebirds, Short-billed Dowitcher, Summer Swallows, Swallows on July 16, 2013 by rhughes. Willet (click to see the larger version). 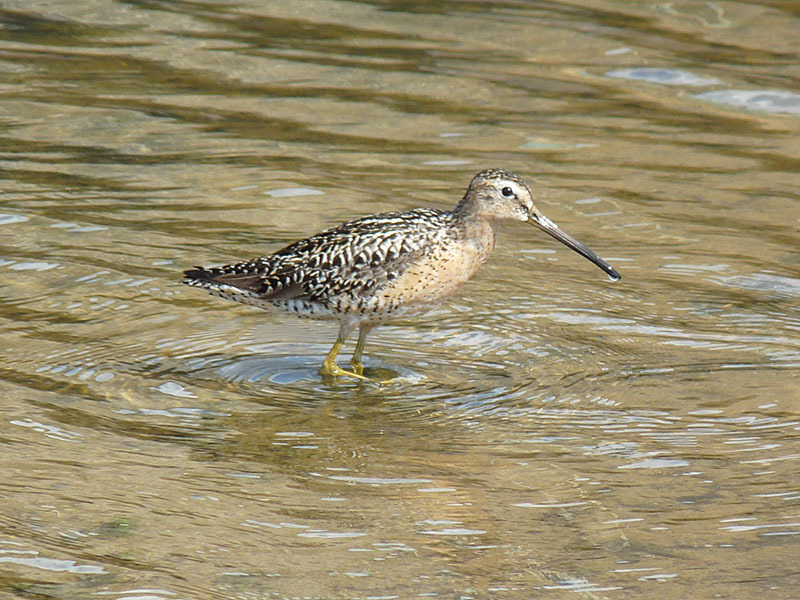 Shorebird migration has been underway for about a week now, with Least Sandpipers, Lesser Yellowlegs, and Willets being seen. 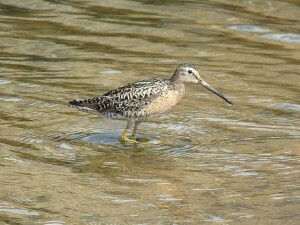 These are usually the first shorebirds to return. I saw and photographed the adult bird pictured to the right inside the protected area at the east end of the beach. On a related note, the Chicago Park District fenced off Montrose Dunes on the west and south sides for the extended July 4th weekend to protect it from the thousands of concertgoers attending the WaveFront festival. This was a good thing. 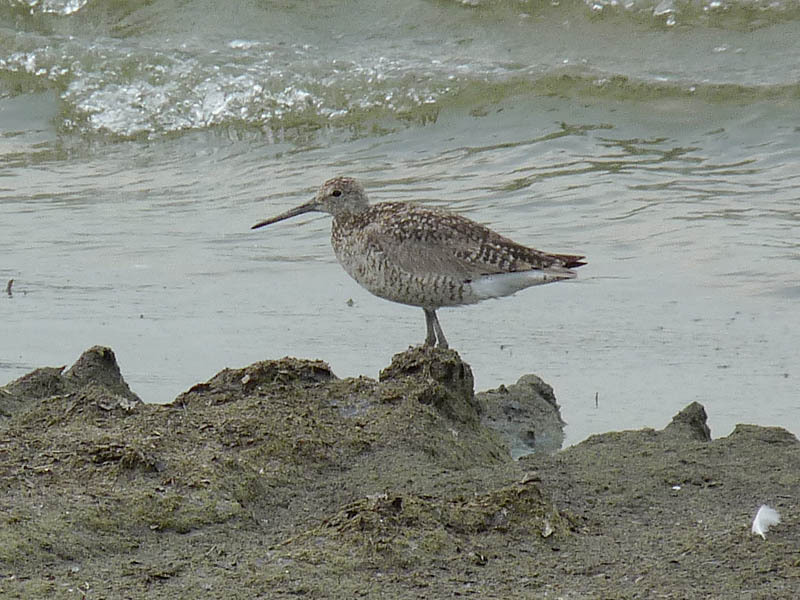 This entry was posted in Summer Bird Reports and tagged Shorebirds, Willet on July 8, 2013 by rhughes.